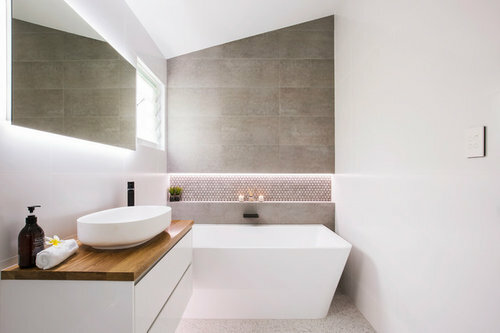 Our clients wanted to create a modern coastal bathroom with lots of lighting. 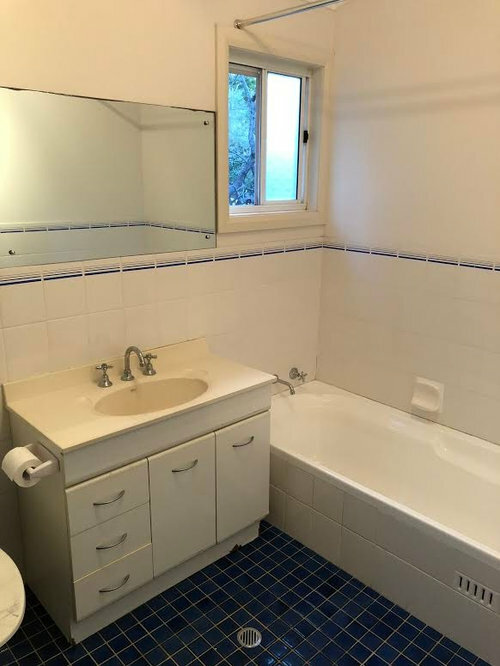 They needed a complete renovation to be done after a shower screen leak and they were in serious need of updating having not been touched in over 20 years. 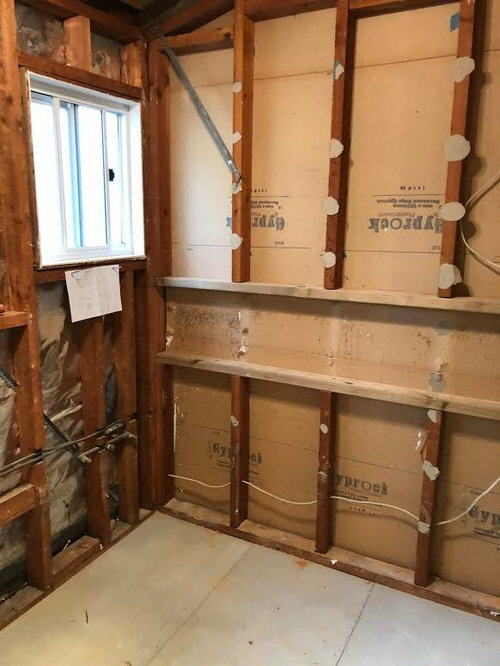 We gutted the entire bathroom and stripped back everything to the frame, along with adding in all new piping. 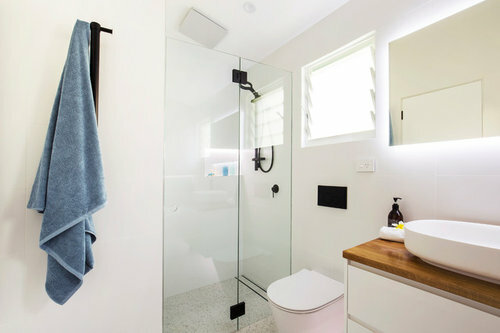 We added in statement features such as matte black handles, tapware and mosaic tiles to tie everything together and add dimension to the space. It was crucial to take a lot of features out. The things that dont stand out take these bathrooms to the next level like the line matching of tiles, working full tiles without cuts, shower screen that matches the window head, no reveals on the windows, the positioning of the strip drain, the 900x450 format terrazzo floor tiles meaning there was only 1 grout join in the floor, fully frameless shower screen with no visible fixings, wall hung in wall cistern toilet, wall hung vanity, neiches in the shower and over bath, vertical heated towel rail, back to wall bath and slimline anodised tile trim all go to give a very clean minimal look that still feels comfortable. 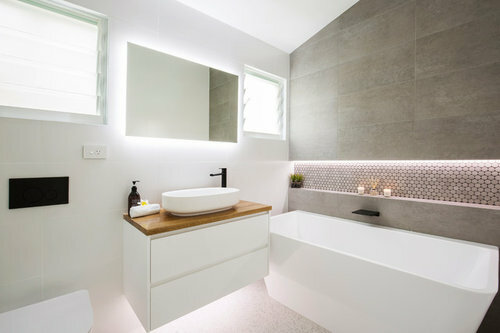 New louvre windows were also added in allowing more natural light into the space, along with LED strip lighting being added to the bath and shower neiches, under the vanity and halo lighting around the mirror. Check out entire project here! Absolutely gorgeous! I love it! Your clients must find any excuse to be in that space :) The big problem they must have.... is finding a reason to leave it lol! Wow! Such an amazing transformation! This is Amazing! Beautiful Transformation. So bright and light now! What a gorgeous change! It looks amazing! I like what you have done i this bathroom, there is only one thing that could have been done better and that’s the position of the mixer tap for the shower. 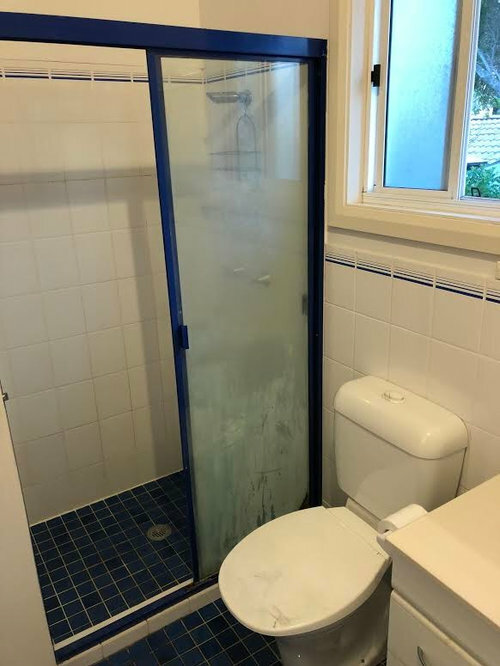 You should have access to it without getting wet , so it should have been positioned on the back wall closer to the towel hook. So you can turn it on and wait for correct water temperature before you get in. If the mixer was on the opposite wall then you wouldnt be able to open the door inways. The shower head is adjustable so just angle it down so you dont get wet turn the tap on and when the temperature is right angle it back up again. Before & After Photos of this Outstanding Kitchen Transformation!